Congratulations and best of luck to all NJSRA Athletes who qualified to post season events at Whiteface, Gore, Sugarloaf and Gunstock. Invites have been sent out to most athletes and we have had an overwhelming response with almost 100 athletes going north over the next few weeks. We're proud of you and we know you'll represent NJSRA well. I also want to recognize our age category chairs who have spent hours and days organizing and managing the post season ranking and event invitations. It's a "brutal" job and we're thankful for your commitment and for sticking with it when the going gets tough. We cannot do this without you. Take Note!f Post season jackets are available for purchase $142 ea. from now until Sunday 3/10 so please get your order in now. The same jackets are also availble for non-qualifier and parents, siblings, coaches. Those jackets will not mention State Team nor will it mention any post season event. NJSRA hoodies will be available for purchase soon as well and an order form will be sent out in a separate communication. Stay tuned for further communication in regards to the end of season NJSRA banquet last Sunday in April. On behalf of NJSRA I'd like to apologize for the mistakes made calculating and pubishing the 2019 Final Standings and how this impacted athlete invitations to post season events. The subsequent emails notifications ref. error or lack thereof is also a learning opportunity we'll take to heart. Level 100 course at Mountain Creek North, Sunday January 6 and Monday January 7 from 8 am to 4 pm. The Level 100 course is the first step in the formal education process for snow sport coaches, covering the fundamentals of sport, while also introducing the topics of long term athlete development, pedagogy, coaching ethics, training environments, effective planning and more. McAfee Ski Shop is Ready for Winter! Please note the most recent changes to the NJSRA Race schedule as of Thursday February 22nd 2018. The Karen Weibel Race on March 3rd, 2018 has been moved to Mount Peter Ski Area. The U16/U19/U21 GS race on Sunday February 25th, 2018 has been moved back one week to Sunday March 4th, 2018. McAfee Ski & Snowboard is announcing the expansion of their Race department for the 2017/2018 season with expanded selection, boot fitting services & new staff members. Mark your calendar for the return of the Audi FIS Women's Ski World Cup to Killington, Vermont on November 25 and 26, 2017. Following the rousing success of its 2016 event, Killington has been chosen to host the races on Thanksgiving weekend through 2018. For all the parents, coaches and anyone over the age of 18 that has an interest in ski racing, NJSRA is happy to announce that Master's racing will once again be hosted in our area. 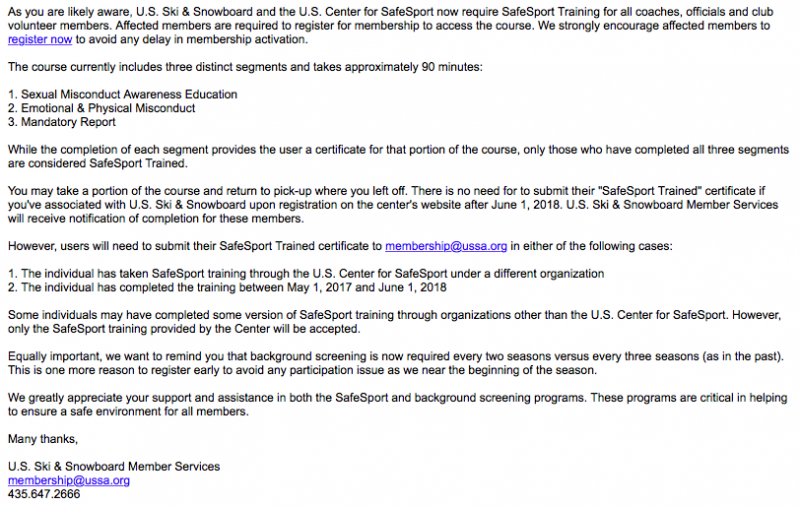 Would you like to give back to the sport of Ski Racing? NJSRA is looking for Volunteers and Officials. Come to one of the three NJSRA Officials clinics being offered this season to get more information. There will be 3 Officials Clinics offered by NJSRA this season. 2 of the clinics will be an Alpine official's intro, 2018 update, Official's review, & Referee Certification Clinic. Candidates may take any exam with the exception of Timing and Calculations. Congratulations to Luca Pizzale for writing the winning essay, 2 years in a row!! !